The classic guide to raising your bottom line with the perfect compensation strategy―fully revised and updated! Nothing motivates a sales force better than a powerful compensation program. And when your salespeople are motivated, revenue soars. But how do you design a program ideally suited for your business strategy and organizational needs? It’s a delicate balance that makes all the difference between profit and loss. More and more sales leaders have turned to Compensating the Sales Force to help them discover problems in their present system and create a compensation program that works best for their needs. Now, in the second edition of this authoritative, jargon-free handbook, sales compensation guru David J. Cichelli brings you completely up to date on setting target pay, selecting the right performance measures, and establishing quotas. He supplies clear guidelines for building the right compensation plan for any type of firm, of any size, in any industry, and he offers step-by-step procedures for implementing each approach. The book also includes all-new chapters for global, complex sales organizations and hard-to-compensate sales jobs. Using the lessons in Compensating the Sales Force, you’ll construct and calculate accurate formulas for payout purposes and establish highly efficient support programs, such as sales crediting and account assignment. 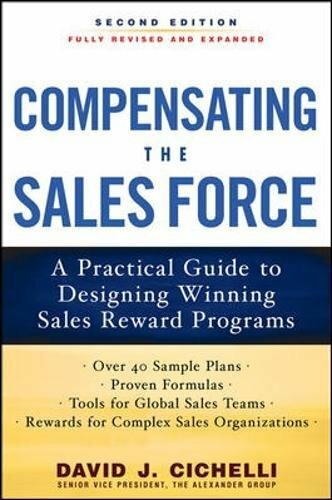 Complete with dozens of real-world examples that illustrate important points and demonstrate specific techniques and procedures, Compensating the Sales Force provides all the tools you need to design and implement a sales compensation plan that maximizes profits―and keeps them climbing. With brand-new chapters on GLOBAL SALES TEAMS amd COMPLEX SALES ORGANIZATIONS!